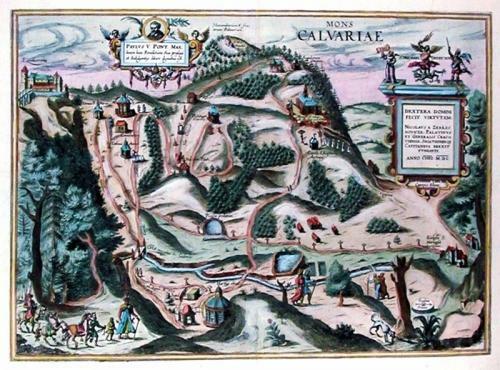 Description: Mount Calvary (Kalwaria Zebrzydowska), a UNESCO World heritage site, was built on orders of Mikolaj (Nicholas) Zebrzydowski starting in 1600. In was meant to represent Jerusalem and the Way of the Cross and is a major pilgrimage site in southern Poland close to the town of Wadowice, the birthplace of Pope John Paul II. Condition: AA, small puncture in lower margin without lose. Slight toning along the outer edges of the sheet, outside of the engraved area.